Putting health first: Volcano Vaporizer Technology. Free Space Case Grinder & Free UPS Shipping (cont US only) w/every Volcano Vaporizer. 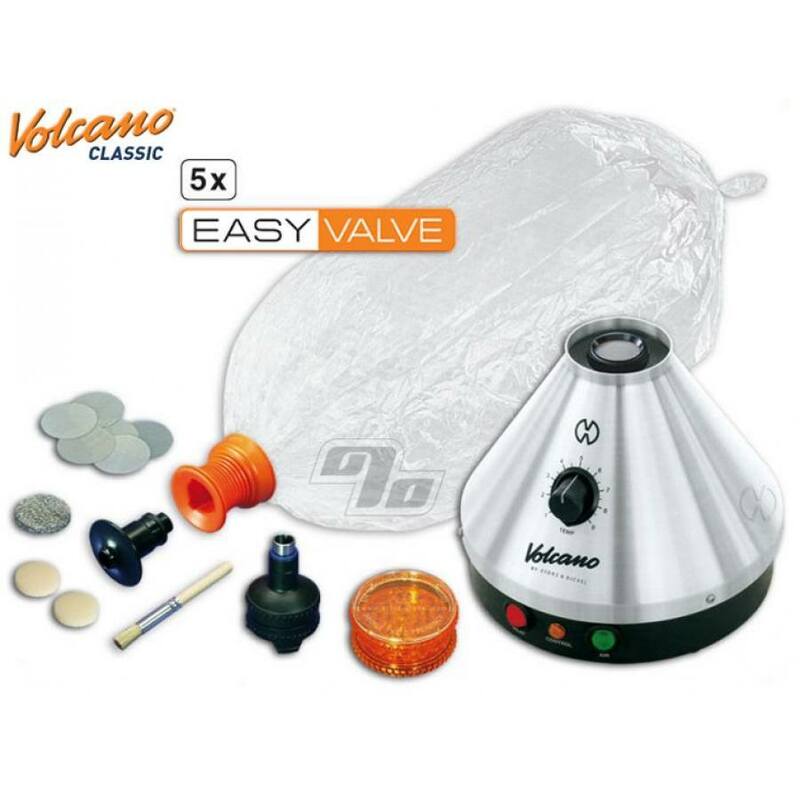 The Classic Volcano Vaporizer releases the active ingredients and flavors from herbs through vaporization by hot air (convection). Optimum vaporization of the active ingredients reduces the development of carcinogens and odors to a minimum. This means that even non-smokers find the vaporizer enjoyable and non-irritating. The addition of the Easy Valve set makes it even easier to use with bags already to go for you and super lightweight. 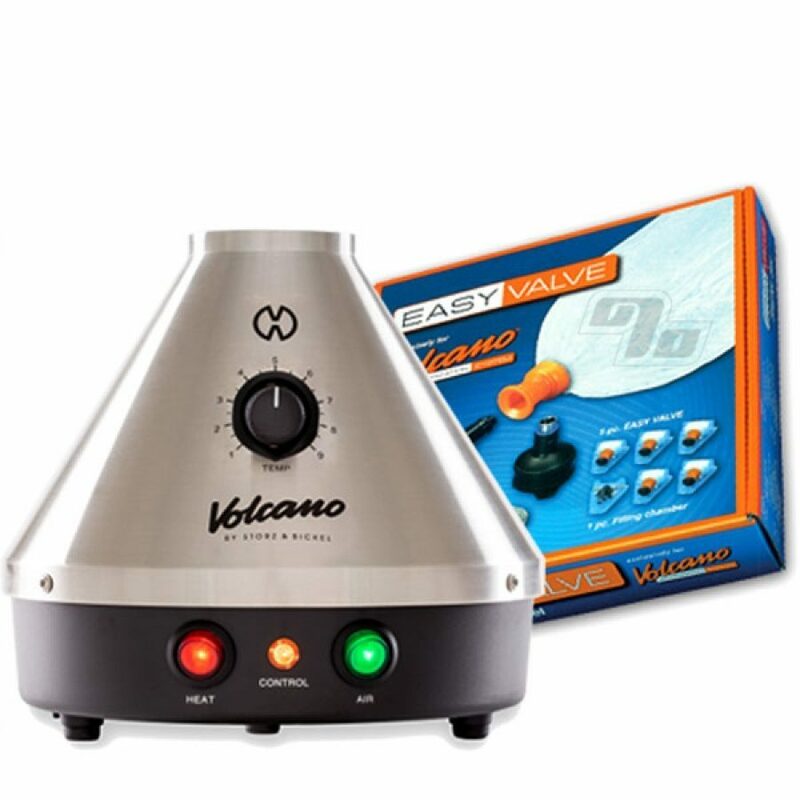 An additional advantage of the Volcano Vaporizer is that the active ingredients are used up to 4 times more completely when compared with smoking. This alone helps makes an investment in the Volcano pay for itself in no time. The unique patented Volcano System technology fills the included balloon with air enriched with the active ingredients and herb flavoring. This takes place via a valve which is then separated from the device and is portable. This means that the active ingredients can be savored at ease, both comfortably and safely away from any hot or heavy items. The Volcano has been the most technically advanced and professional vaporizer available for over a decade. Storz and Bickel's exceptional safety record and quality product speaks for itself. 1 Percent first imported the Volcano in 2003 and a few of us have units still in service from around that time. Stringent selection of material, impeccable processing and practical in its form, the Volcano combines simplicity of use, a high degree of safety and efficiency. Reliable technology; "Designed and Manufactured in Germany for the highest quality and durability. Backed by a Three Year manufacturer's warranty with a service center in the US. 1. The filling chamber is filled with ground up herbs. 2. The balloon quickly inflates with a light vapor consisting of the herbal material's flavoring and active ingredients. 3. The Volcano click-system: Simply connect the mouthpiece onto the valve. 4. The vapors can be inhaled in comfort from the valve balloon and passed among many people before needing to reload. Vapors will be usable for up to one hour after vaporization is complete. This vaporizer can only ship to the address listed on your credit card account -or- can be paid for in advance with Bitcoin, check or money order. Discounts not applicable on Volcano products as per manufacturer requirements. I've had my volcano for about 3.5 months now. Everyday has been a pure joy! No regrets and easily paid for itself in the first month just in herb savings. BONUS: Have a huge jar of abv (already been vaped) that I'm going to make some nice brownies with! Like the solid valve but went with this easy valve because I'm lazy and have no patience for replacing balloons myself.